A few months ago, while at Santa Marinella beach (moment of silence for the sunshine and warmth of summer!) I overheard a handful of Italians around my age discussing one of the pillars of Italian cuisine: pizza. The pizza in question was ordered at a new pizzeria (I didn't catch the name, I'm sorry to say) where a few of the group had recently had dinner. My eavesdropping taught me that one of the girls had ordered the classic Margherita: she waxed poetic about how the crust was perfectly crisp (as a good Roman pizza should be!) the toppings fresh, the mozzarella ante upped with the addition of a little mozzarella di bufala, and the whole thing, in short, was a joy to eat. Not long after she was done describing her recent pizza, I dozed off on my lounge chair, only to wake up some time later to find that the discussion was ongoing: now the subject was pizza al taglio, or pizza by the slice, more specifically the beauty of simple, understated pizza rossa, fresh out of the oven, drizzled with olive and sprinkled with parsley, no-cheese-needed. Naturally, the discussion then turned to where to have pizza for dinner later that evening. Not long ago, I was at my local supermarket for the usual weekly grocery run when I overheard an elderly woman on the phone. She was paused in the vegetable aisle, debating with her (son? daughter? grandson?) about what to make for dinner that night. She could pick up some scarola, or escarole, that they could eat cooked down slowly in the pan with lots of olive oil, garlic, and white beans, or if they wanted, a different preparation, escarole with sweet raisins and a sprinkle of pine nuts -- both would go very nicely with the roasted sea bass they were eating, she thought. Also, were they out of prosciutto? They were? Crudo or cotto? Just last month, when I was in Turin visiting family, I took a walk with my great aunt, Zia Marcella. Her son -- my cousin -- Tommaso lives and works in Malaysia, and she visits him frequently. She was describing with gusto the foods that she had eaten there on her last trip; there were spring rolls, crunchy and golden and packed with carrots and jicama; noodles with thick slabs of pork and mung bean sprouts; and a sort of pollo con miele (chicken roasted with honey) that she didn't think she would like at all (chicken and honey?! together!) but that in the end was fantastic, a sort of spicy sweet combo, where the honey made a sticky, luscious sauce for the chicken. As we walked, a tiny, elderly woman on the street passing by us with her own groceries overheard our discussion. "Pollo con miele, signora? Ma come si prepara? Sembra buonissimo!" (Chicken with honey? How do you make that?! Sounds delicious!) From there, a spirited conversation about honey chicken and food in Malaysia ensued, right on the street corner. So! I won't be saying anything particularly earth-shattering here when I say that Italians love food, and feel very passionately about it -- and how could they not? They live in a country that has an intense respect for food, so much so that there are gastronomic "rules" to ensure you best enjoy it (no cheese with seafood, for example!) Italy is the home of stellar wine, pasta, and cheese (to name just a few) and a variety of regional cuisines that its people are ardently proud of (just ask any Roman about how a good carbonara should be done and you'll see what I mean). Given this, then, it is no less surprising that Italian's love to talk about food. Indeed, when I reached the point in my Italian language studies where I could freely understand conversations on the street, I realized that this was one of the main topics of discussion. As someone who feels quite strongly about eating and good food myself, it is one of those little things that I love about Italy and the Italian people in general, and nothing makes me smile more than an intense conversation regarding what to eat for dinner that night. And what does this all have to do with pumpkin pizza, you might ask?! 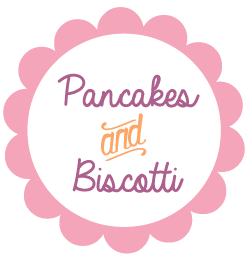 I found myself at a coffee break on Monday morning with one of my adored frolleagues, an enthusiastic home cook/baker herself, who asked me what I had done that weekend. I had made a very autumnal pumpkin pizza, I said. 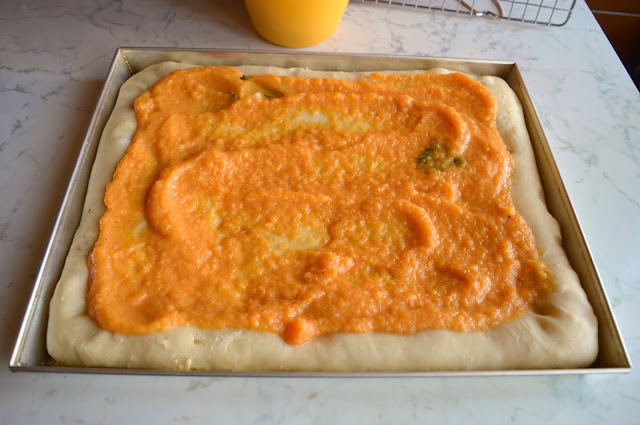 I'd made the dough myself -- a slow rise overnight, for good flavor -- and topped it with a roasted pumpkin base, pureed, and then smoothed out with a little sage infused bechamel. On top of this pumpkin, a whole lot of super sweet, very slowly cooked caramelized onions, balanced out by a dash of crispy, salty, I make-everything-better pancetta, plus two kind of cheese, classic mozzarella and a little sharp Parmesan, all dotted with a little extra sage. 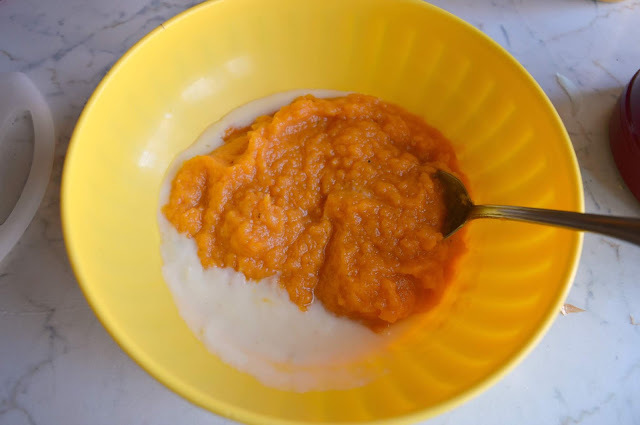 The color was gorgeous, a bright, fiery, orange, the flavors were on point, a mix of sweet and salty and herby, and it was so good, I was thinking of remaking it all in the next few days, too. 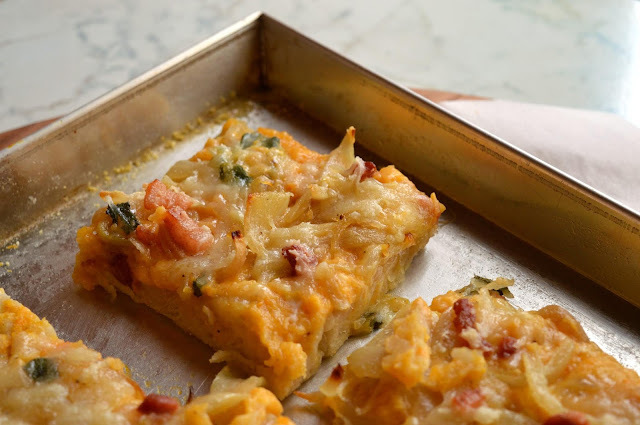 My colleague was impressed -- she wanted the recipe -- and also, had she mentioned that she'd made a savory pumpkin quick bread not long ago, with mortadella and herbs? The rest of our breakfast was spent discussing pumpkin, and what to cook with it. Ehem. Bottom line: my "italianization" is, I think, in full effect. I'll be heading to Munich this week (pretzels, here I come!) but will be back soon with (non-recipe) posts. In the meantime: Happy Thanksgiving, everyone! 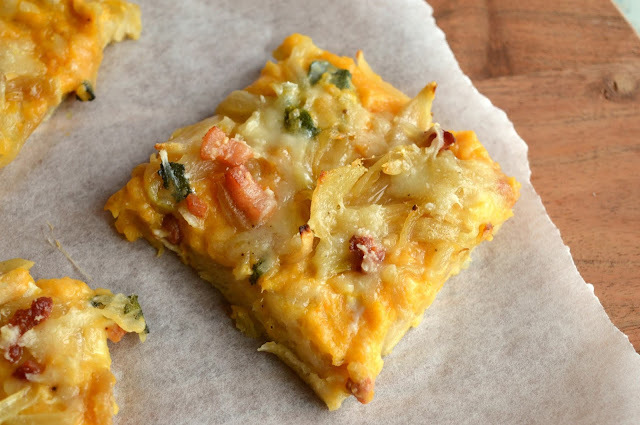 And while we're on Thanksgiving, this would be a sort of Thanksgiving-y pizza, if you're looking to go non-traditional this year. A couple of notes: This pizza is fairly flexible and be as involved or not as you'd like it to be; you can use whatever cheeses you want, guanciale instead of pancetta, or leave out the meat all together if you're cooking for vegetarians (thought it is really spectacular here). 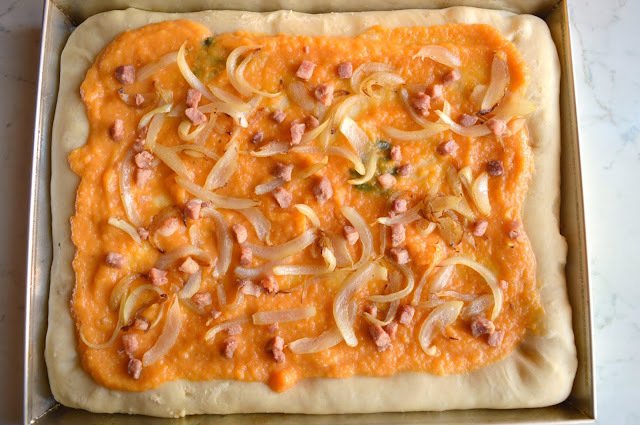 You can add more or less onions if you want, and use whatever pizza dough you wish -- I use the Lahey recipe, as its the easiest I know -- but store-bought pizza dough would be fine too. If you too opt for the Lahey recipe, note that the color is rather pale; next time I use it, I will consider par-baking for a bit before to see if that helps. You could also probably leave out the bechamel if you don't want to wash another pan, but I like how it adds a little hint of sage flavor and smooths out the butternut squash/pumpkn mixture. Bottom line: the quantities below are really just suggestions. Having said that: whatever cheeses you decide to use here -- don't use fresh mozzarella (mozzarella di bufala) which has a lot of moisture. In this case its best to use the dry cows milk mozzarella that is easily grated. Finally: you'll see that the pictures below look a little different -- they were from two different test runs, one where I used more cheese and another where I used less. The verdict is that more cheese is better, but the pictures were too nice not to share. 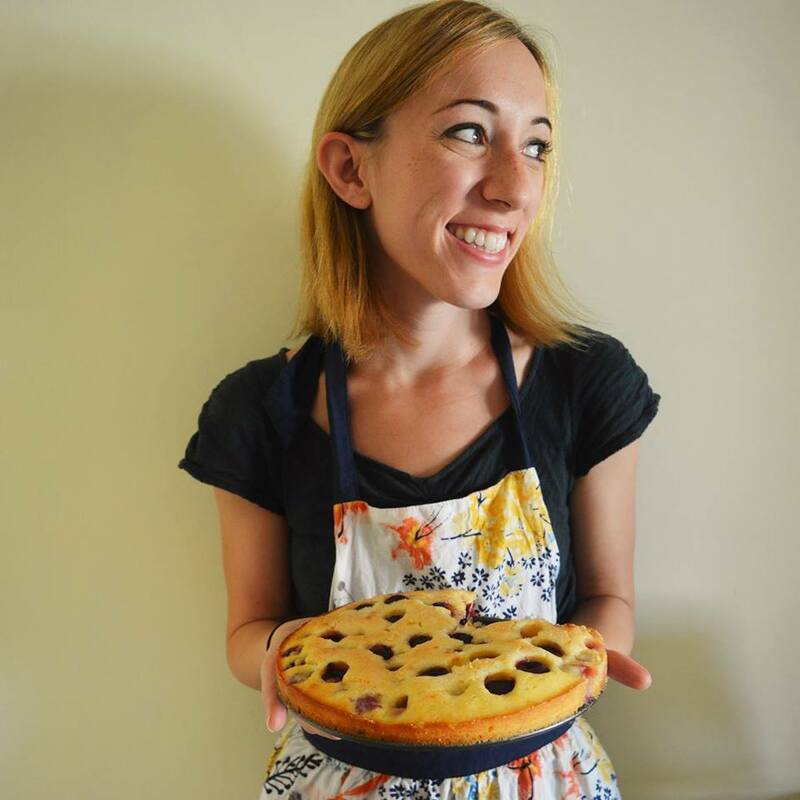 Looking for other recipes with zucca? 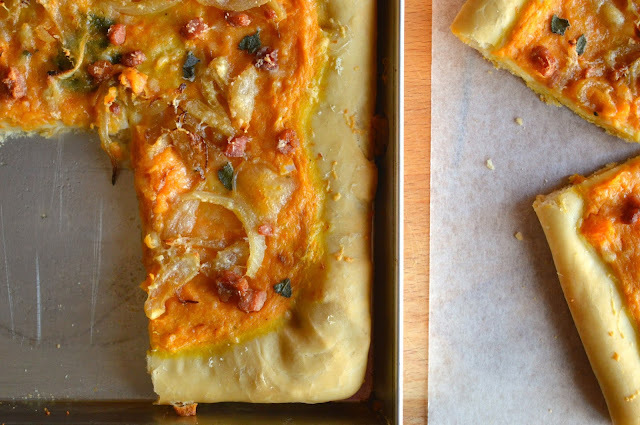 I've got this Butternut Squash and Caramelized Onion Galette, this Pappardelle with Butternut Squash and Porcini, this Butternut Squash Lasagna, and this Butternut Squash Risotto, not to mention these Pumpkin PopTarts, this Pumpkin Pie, these Pumpkin Pancakes, this Pumpkin Bread, this Pumpkin Spice French Toast, these Pumpkin Chocolate Chip Bars, this Pumpkin Gingerbread Cake, and this Pumpkin Cheesecake with Praline Sauce. Start with your squash! Preheat the oven to 375 degrees Fahrenheit (190 degrees Celsius). 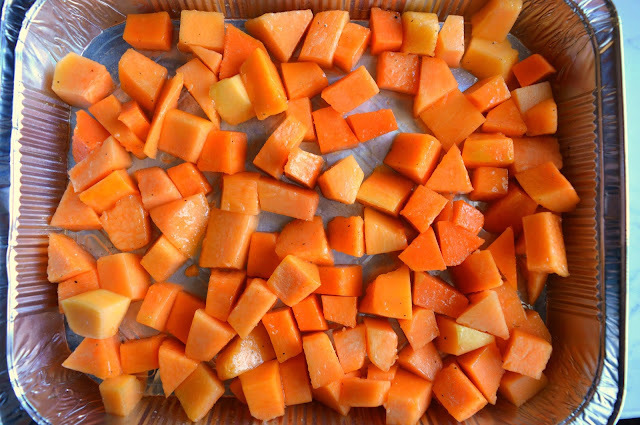 Put the squash in a large foil lined baking sheet or roasting pan and toss with about 1 tablespoon of olive oil and a good sprinkle of salt and pepper. Roast for 30 minutes or until the squash is tender, turning it midway throughout the baking time. 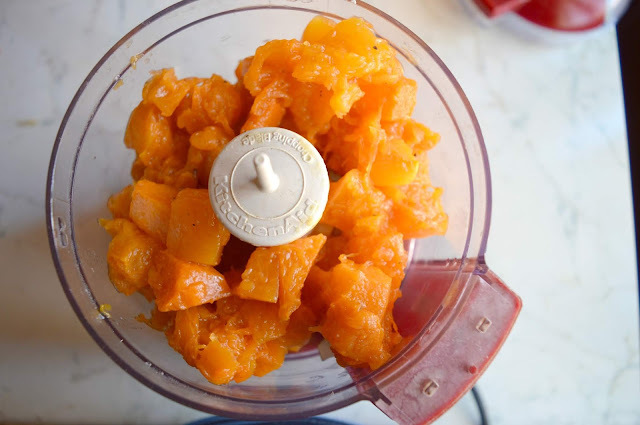 Set aside to cool slightly, and then using a food processor, an immersion blender, or just a potato masher if you don't mind butternut squash that is not perfectly smooth, puree/mash your squash and set aside. Next, caramelize your onions! While the squash is roasting, heat enough olive oil to coat the bottom of a skillet and cook the onions over low heat with a pinch of sugar and a bit of salt, stirring occasionally, until soft and lightly golden brown, about 20 minutes. When the onions are caramelized, move them to another plate and cook your pancetta in the same pan until crisp and golden brown. Move the pancetta to a paper towel lined plate to drain. Preheat the oven to its top temperature (around 450 degrees Fahrenheit for me). If you have a pizza stone, feel free to preheat it at this stage as well. 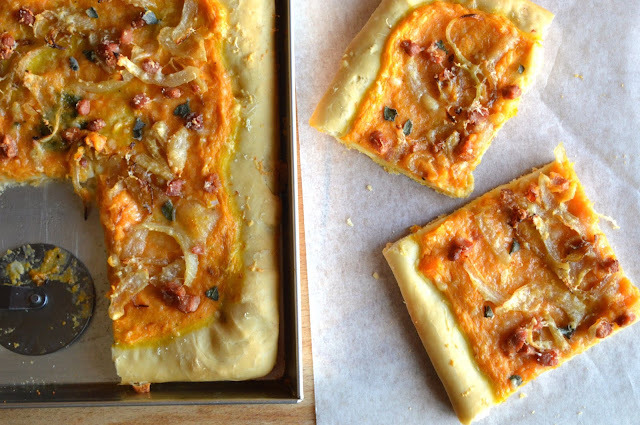 Top the squash base with the caramelized onions, pancetta, cheese, and extra sage. 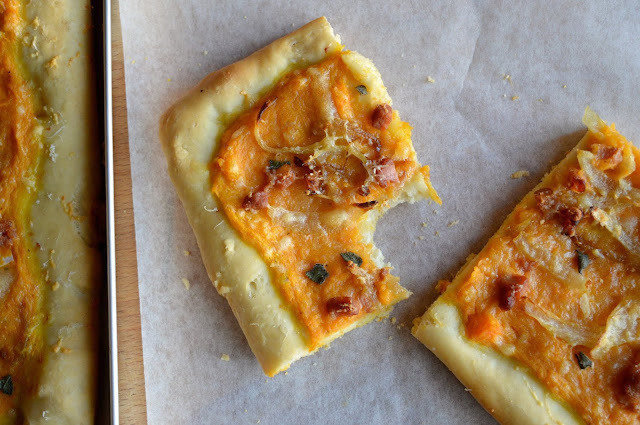 Bake the pizza for 12-15 minutes, or until the crust is no longer doughy and has some color, and the cheese is melted. 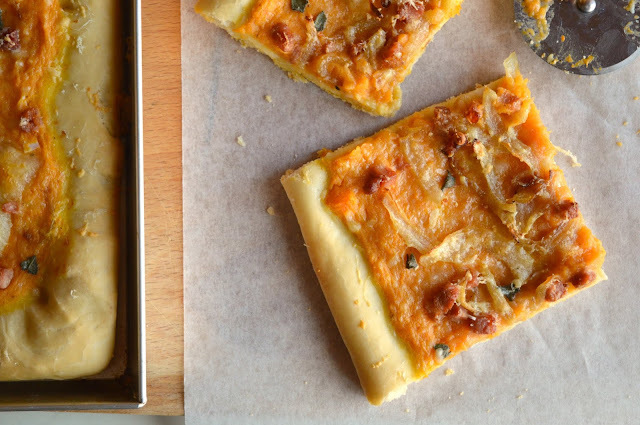 Allow the pizza to cool slightly, and then dig in. Serves about 6.